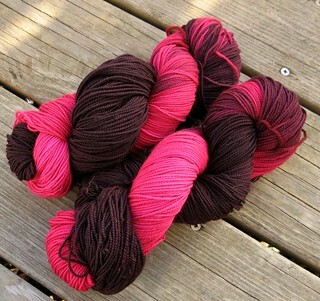 The skein is dip-dyed in bright pink and a rich purpley black, so naturally it will pool and flash and stripe as the stitch count varies. This is always a concern with using hand-dyed yarn that has a strong color difference … but in this case the pattern is working up well. I’m using a simple and bold lace pattern, so that it doesn’t fight with the yarn — so far so good!